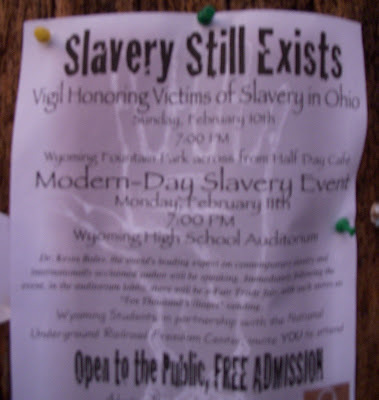 I really don't think there is slavery in Ohio, but maybe I am wrong. 27 million slaves world-wide. 17,000 victims trafficked into the United States each year. You are benefiting from slavery. Wyoming High School is doing something about it. On February 11th, learn about the issue of modern-day slavery, and how it still goes on world-wide, even in the United States. Listen to speaker Kathleen Davis of the Freedom Center, and author Kevin Bales talk about the issue of modern-day slavery. Hear and see live music being played from around the world. Learn how slavery affects you, and how you can do your part in putting an end to slavery. Have an opportunity to see and buy hand-made, slave free crafts from the store Ten Thousand Villages, who will be vending at the event. Come to learn and be inspired about putting an end to slavery. The week before the event, attend a viewing of a movie on modern-day slavery, and attend a candle-light vigil for the slaves today. Together, we can put an end to slavery. "Ohio itself plays a large role in modern slavery, with Toledo being considered by the FBI as one of the top – if not the number one – cities for recruiting children into underage prostitution. " yeah, it doesn exist, but is typically called "trafficking in persons". Even president bush has talked about it and has started to make an effort to stop it. Generally it involves promising a job and then stealing a passport and forcing into prostitution. I read the link provided and some other info I googled and I am still not completely convinced that slavery exists in Ohio, at least not in significant numbers or in a pure sense of the word slavery. So many of the stories are anecdotal with people afraid to give their names because they will be deported. I've only done 10 minutes of research so I may be wrong, but human trafficking seems like a more descriptive term. slavery is really the most descriptive word you can use. Slavery, as said by Kevin Bales, is "about one person controlling another person using violence or even the threat of violence; paying the person absolutely nothing, then using that situation to exploit them economically, to make money off of them." There are 27 million slaves on our earth that follow that definition above. The thing about making Ohio so prevalent in slavery is that most of the United States border control is on Mexico, leaving Canada more alone. Then Ohio has the great lakes which connect it to Canada, and so many slaves get transported to Ohio from Canada via ship. And since the coast guard isn't going to search every ship for slavery, traffickers have a pretty easy time getting slaves into the U.S., largely into Ohio. And slavery isn't all Prostitution either. There are domestic workers, as seen in the linked article, there are slaves in the Dominican Republic being forced at gunpoint to cut sugar cane that gets sold in the United States, there are children as young as 5 years old in India weaving rugs that could be on your floor at home, there are so many goods we buy that are connected to slavery. You are so true in saying it is unbelievably sad, but not only sad, it is purely disgusting! There are stories of masters fracturing their own arms beating their slaves! There are stories of people, even children, being forced to work 20 hour days! The following websites are really eye opening! but come to the event and vigil! If you're interested at all in learning more about slavery today, this is the best chance you have! The world's leading expert on modern slavery will be talking, Dr. Kevin Bales, and afterwords there will be a Fair Trade Fair to learn more about and buy slave-free products. -Here's another link about modern slavery, but this one is a study on Modern-Day slavery in Ohio. Thanks for the info. I will try to keep reading on the subject.